The national leader of the All Progressive Congress (APC) Bola Tinibu revealed the statement accredited to president Buhari saying, “I belong to everybody and i belong to nobody” was not targeted at him as speculated by some individuals. President Buhari had during his swearing-in ceremony on May 29, 2015, said “ I belong to everybody and i belong to nobody” was widely believed that it was directed at Asiwaju Tinibu. Tinibu revealed he find it interesting as those are the words he expected from President Buhari and wanted him to be as well. Tinibu disclosed this during a book lunch “Nigeria on firmer ground, towards lasting peace and progress” written on the achievement of Buhari administration by the President Media team. 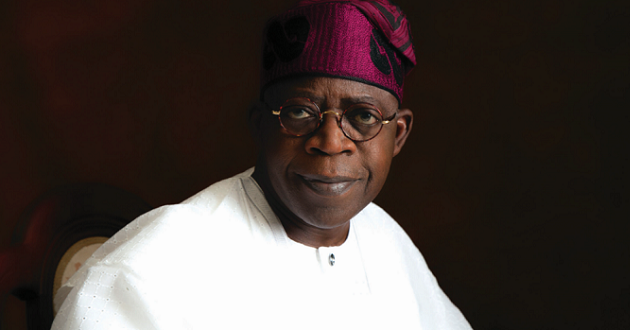 Represented by a former Lagos state commissioner of Information, Dele Alake, Tinubu said, “Unlike others whom their target policy is to enrich friends and cronies, Buhari tore the nobler stand that it was better to help the millions of hard-working Nigerians and maintain the national economy instead of a festive party for a select few individuals. Mr, Alake added, “True to his word, President Buhari has achieved a lot in his time in office despite the global condition of shrunken oil prices. In his remarks, Buhari advised youths in the country not to allow themselves to be used by desperate politicians in fomenting trouble through snatching of the ballot and endanger the country during the forthcoming elections. Mr, Buhari assured Nigerians that the security agencies would be deployed to protect voters during the elections. ” As Nigeria prepares to give her citizens the opportunity to choose their leaders and representatives in the next few weeks, I urge all Nigerians to exercise their civic duty in an atmosphere of peace and security. The President added that elections will come and go, but we need a country in which to live. I am appealing to our youths: do not allow yourselves to be used by desperate politicians to violate the sanctity of the ballot and endanger our country. I assure you that the security agencies will protect you as you go out to vote without fear of violence or molestation,”.